"When I was a little kid, I used to wonder how could anybody not be interested in the whole Universe. I think that child-like wonder of what's in the Universe is still there in all of us," said Peter Eisenhardt, WISE project scientist from the Jet Propulsion Laboratory. The Wide-field Infrared Survey Explorer will use advanced technologies to scan the sky with the clarity of a modern digital camera to reveal asteroids, comets, brown dwarfs, ultraluminous galaxies and new born stars that humans haven't laid eyes on. "The last time we mapped the whole sky at these particular infrared wavelengths was 26 years ago," said Ned Wright, WISE principal investigator from UCLA. "Infrared technology has come a long way since then. The old all-sky infrared pictures were like impressionist paintings -- now, we'll have images that look like actual photographs." At the heart of this 1,460-pound spacecraft is a 16-inch telescope and four state-of-the-art infrared detectors containing one million pixels each, all packed inside a Thermos bottle-like tank filled with frozen hydrogen. "WISE is going to be taking a lot of data. We're going to be taking a four-color image -- we have four different bands -- every 11 seconds. And we'll be doing that essentially continuously throughout the duration of the mission. That works out to millions of images. We will stitch these together to make a panoramic view of the whole sky," Wright said. A United Launch Alliance Delta 2 rocket successfully boosted WISE into polar orbit this morning from Vandenberg Air Force Base in California, lifting off at 6:09:33 a.m. local time (9:09 a.m. EST; 1409 GMT). 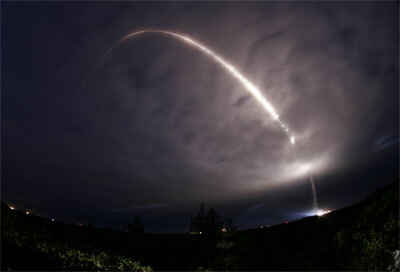 The two-stage vehicle deployed the craft into an orbit 325 miles above Earth about 55 minutes after launch. Ground controllers established contact with the craft via NASA's network of Tracking and Data Relay Satellites and confirmed WISE was operating properly. In about 16 days, a protective cover on the telescope will be spring-ejected. The mapping mission should commence in mid-January after testing and calibrations are completed. WISE will have a scant nine months to perform its survey of the Universe before the solid hydrogen that's needed to keep its infrared optics cold is gone. "Our view of the whole Universe has mostly been compiled by looking at light we can see with our eye. We have only fairly crude maps of the Universe at other wavelengths, particularly in the infrared. So there could be big objects, very interesting objects that are out there, maybe not very far away that if we'd just look in the right place in the infrared we'll find them," said Eisenhardt. "At the most basic level, I want to know what's out there. That's what really excites me. WISE is going to tell us much more than we know now." "We're going to find things that nobody has imagined yet," predicts Wright. The infrared nature of WISE enables the craft observe the heat emitted from unknown objects either hidden behind dusty veils or impossible to see in visible light. The telescope will be capable of imaging the glow from targets ranging in temperature from -330 degrees F to 1,300 degrees F.
"Because WISE takes pictures of infrared light, or heat, we have to keep the telescope and detectors themselves very cold. Otherwise, all we would see is our own heat. Sort of like going out in the middle of the night to look at the stars and shining a bright flashlight in your own eyes," said John Elwell, WISE science instrument project manager from the Space Dynamics Laboratory. Scientists expect to release part of the survey, representing about 75 percent of the sky, about six months after the mission ends. The complete sky catalog should be available in March 2012. "This new sky map that WISE will generate is hundreds of times more sensitive than previous maps. It will represent the infrared mother load that astronomers will mine for years to come," said Jon Morse, director of astronomy and physics division at NASA Headquarters. What this diminutive spacecraft sees and learns will inform users of other space- and ground-based observatories in the present and future to guide fruitful studies, officials say. "WISE will give us a road map that will be used by big telescopes," Wright says, "so they can visit or point at the most interesting objects in the sky." "WISE is very like a wide-angle lens, taking an all-sky picture. The big telescopes are like telephoto lenses. Both are necessary for a skilled photographer," Wright added. "It's definitely like the old scouts in the Westerns to just go up to the next ridge and see what's there. In that way, it's a scout for the big telescopes to follow up." The voluminous imagery from WISE will form an authoritative atlas that will be referenced for countless years to come. "The wow factor of WISE is we are going to much, much deeper -- a hundred times deeper in some wavelengths and even a thousand times deeper in other wavelengths -- than we've ever gone before. We are going to see in the solar system a 100,000 new asteroids or more, we'll see new structures and targets in the Milky Way and we're going to see hundreds of millions of objects around the sky and open up the extragalaxactic, full-sky survey," said Morse. "The legacy of all-sky surveys endures for decades," said Eisenhardt. "WISE is going to carry out a sensitive infrared map of the entire sky and it will allow us to learn lots of things about the objects that we already know about and find even more superlative examples, the closest stars and the most luminous galaxies. But perhaps the greatest benefit of an all-sky survey is that you can keep coming back to it. There are objects that are likely to be discovered years after the WISE survey is complete. And if you want to know the infrared properties of those objects, you can come back to the WISE survey and the catalog and the atlas will tell you all about it." A main target for discovery will be brown dwarfs, which are objects that tried to become stars but failed to ignite and now shine mostly in infrared heat. "These are objects that have less than about eight percent of the mass of the Sun, or equivalently about 80 times that mass of Jupiter. These brown dwarfs, or failed stars, are putting out essentially all of their light in the infrared and are optically invisible. So WISE is going to find lots and lots of brown dwarfs," Eisenhardt said. Scientists predict WISE will find about 1,000 nearby brown dwarfs, potentially uncovering some in our backyard. It is possible, the team says, that there may be one of these objects closer to Earth than the nearest known star, which is four light years away. "This is going to transform our view of the solar neighborhood," Eisenhardt said. What's more, these close neighbors could be harboring planets. "Brown dwarfs have evidence for planets around them, so we might also be finding the nearest planetary systems. That's evidence that would come from follow-up observations by more-powerful telescopes such as the James Webb." "There is a chance that the next planetary system beyond our own solar system that is visited by humanity will be around a brown dwarf that is discovered by WISE." "Our predecessor survey, the Infrared Astronomical Satellite, discovered that there's a class of objects called ultraluminous infrared galaxies that shine with over a trillion times the light of the sun. And most of that light comes out in the infrared," Eisenhardt said. These super star-burst galaxies are forming new stars at rates of 1,000 per year. "These are really cataclysmic galaxies in formation. They are rare today, but from studies with Spitzer we actually know they were much more common 10 billion years ago when the Universe was three-to-four times younger than it is today," he continued. "WISE has been designed so that it can detect these cataclysmic, dusty, forming galaxies out to a distance of 10 billion light years over the entire sky. So we are going to find the most super-duper, hyper, ultraluminous-forming galaxies in the Universe, and we'll see just how extreme this forming-galaxy process can get." The benefit to all Earthlings will be WISE's ability to spot asteroids that could threaten the planet some day. "In addition to finding some of the most distant objects in the Universe, it's also going to find some of those closest to home in our own Solar System. And that's the asteroids," said Amy Mainzer, WISE deputy project scientist from JPL. "WISE is going to be finding about a 100,000 new asteroids in the main asteroid belt and we expect it is going to find several hundred new asteroids that get close to Earth's orbit. We call these Near Earth Objects. These are asteroids and comets whose orbits take them close to Earth's orbit." The WISE maps should tell astronomers the true number of asteroids, plus other critical aspects like how they differ in color and the range of sizes. "WISE will also tell us something about the composition of the population of asteroids both in the near-Earth regime and also in the main belt. It is going to give us some information as to whether asteroids are typically light and fluffy like a marshmallow or heavy metal," Mainzer said. "WISE is going to help us prepare for the future so we can better plan mitigation campaign for potentially hazardous asteroids." She added: "WISE is going to find a lot of these dark, hidden objects that are easily missed by visible light telescopes. Dark asteroids can't hide from WISE!"